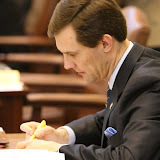 OKLAHOMA CITY – The Oklahoma House of Representatives unanimously passed Senate Bill 249, a measure that will provide relief in response to the May 2013 tornadoes. Governor Mary Fallin applauded passage of the emergency aid legislation. SB 249 will direct $45 million from the Rainy Day Fund to the Office of Emergency Management for immediate tornado relief. These funds will match a portion of the federal funds that have been allocated to local governments for their relief efforts. The funds will be administered by the Oklahoma Office of Emergency Management and used to reimburse local governments for relief efforts related to natural disasters, including the May 19 and May 20 tornadoes. Money from the fund will match 12.5 percent of federal dollars spent to reimburse counties, cities, and towns for infrastructure damages that occur under a presidential disaster declaration. It will also be used to cover extraordinary response costs incurred by state agencies while responding to natural disasters. News outlets are predicting the total dollar amount in damage to exceed the May 3, 1999 tornado, which was greater than $1 billion. Oklahoma Insurance Commissioner John Doak has made early predictions that damage could be well over $2 billion. Senate Bill SB 249 passed unanimously in both the Oklahoma House of Representatives and the Oklahoma State Senate. It was authored by Senate Pro Tem Brian Bingman and Representative Jason Nelson. SB 249 will now go to the desk of Gov. Mary Fallin to be signed into law.